I’m easy to pick. 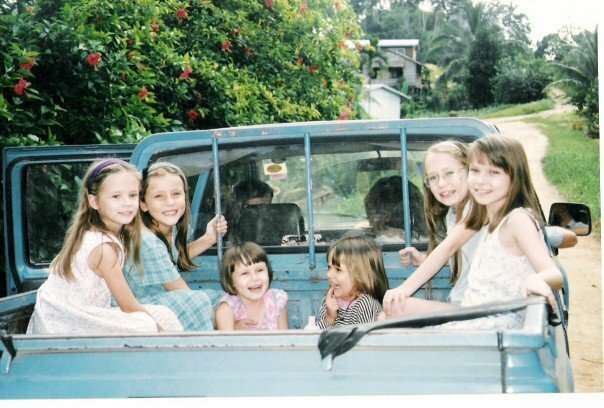 This was my family’s blue truck (twin-cab) in the Solomons you don’t wear seat belts for the most part, you also don’t ever go that fast due to excessively pot-holed roads. We spent many car trips like this in the back, or standing up and yes, my little sister Hannah could only have been no more than five. Laura (in front of me) and our friend Claire (back left) spent a good few hours one day sitting on blowup mats, bouncing around, getting quite sore and cloud gazing on a trip back from Claire’s village. . This was good truck -it carried everything from: dirt, little arikwuo’s (white people) to a funeral party inclusive of body. It was full of rust then and full of memories now. I honestly think that is the most exciting vehicle my family has ever owned, we progressed naturally from there to your typical boring four child vehicle – the Tarago.